The eSecure IP is a complete standalone module that enables security applications by shielding the secret information from the non-secure application running on the main processor. The firewall prevents any unauthorized access to the secret data. 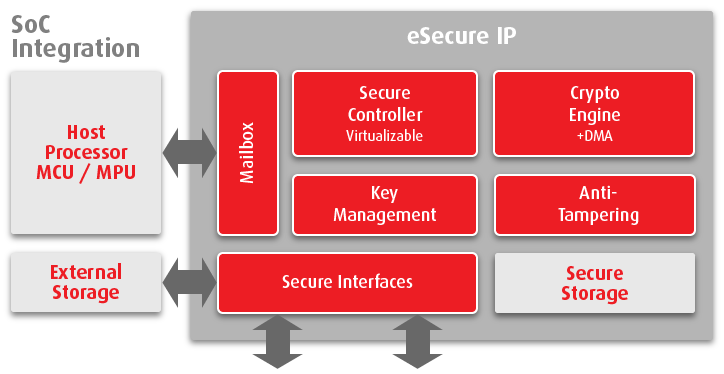 The secure controller embedded in the eSecure module keeps full control of the execution of the security functions. In some designs, the secure controller can be optionally virtualized in the host processor. In order to protect applications and products against counterfeiting and cloning, it is important to be able to uniquely identify each manufactured part. This identification also enables device authentication and per device rights management. A secure application always requires some data to be kept secret. The eSecure IP can store secret keys and other information inside a secure or non-secure storage area. For non-secure area such as external flash memories, the eSecure IP will guarantee the confidentiality and authenticity of the data with strong cryptographic algorithms. In today's connected world, most applications involve secure communication protocols. The eSecure cryptographic engine supports all the latest algorithms for TLS/DTLS 1.3, Thread Networking, Apple HomeKit, Bluetooth, Zigbee and more.